There are loads of Melbourne festivals. The variety is fantastic. Bring the kids, they'll love the costumes, singing and dancing. .......Now, using this page, you can find loads of festivals to see and you can make sure you get there from the beginning so you are at the front of the crowds! 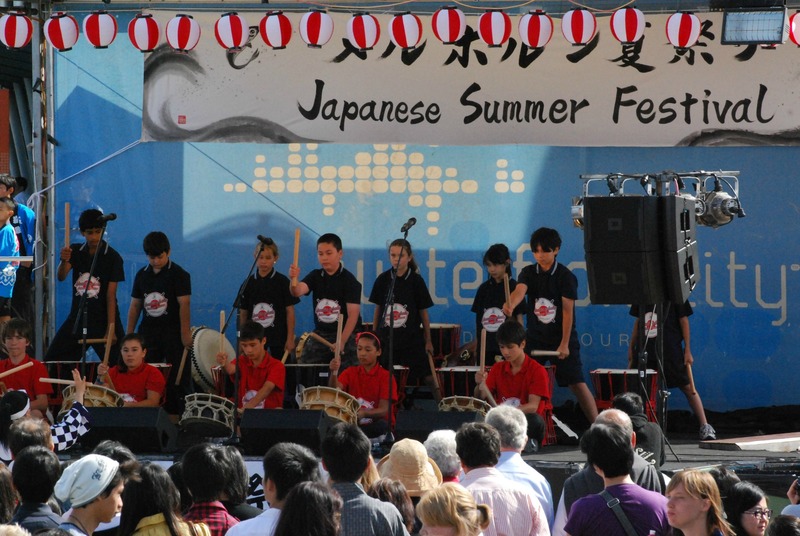 Celebrate with family and friends at the Frankston Waterfront Festival. Great live music, free interactive activities, beach and water sports activiies and fireworks over the bay on the Saturday night make this a must visit summer event. This is Victoria's premier queer arts and cultural festival, for and by LGBTQIA+ communities. There's over 130 events over a three week period during January and February with the main events of the Carnival, T Dance and Pride march and a lot of other events being free. Australia Day weekend is just fabulous!! It's a Melbourne holiday and there is so much to see and do everywhere!! There's events all over Melbourne but the main city events usually include a great parade, loads of stalls with fun free things to do in the Kings Domain, an enormous classic car display, live music, an acrobatic flying display by the RAAF and Government House is also open for a look around (the only day of the year you can do this). Don't miss this day, you'll love it!! 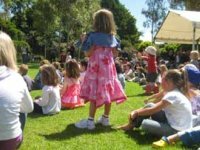 Celebrate the country’s Indigenous culture at Share the Spirit Festival on Australia Day in the Treasury Gardens, East Melbourne. Taking place every year on Australia Day – otherwise known as ‘Survival Day’ to the Indigenous peoples – Share the Spirit has been created by Aboriginal people for all Australians to come together and celebrate the country’s Indigenous culture through non-stop music, performance workshops and information stalls. Indigenous artists and designers from all over Victoria will be selling locally made crafts, traditional artefacts and paintings. 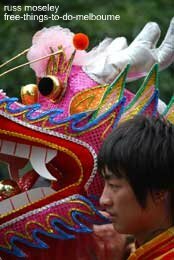 Chinese New Year – sometimes January/sometimes February! 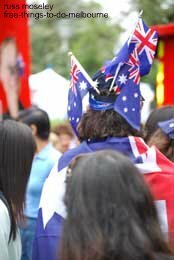 This is a great parade with all the drum banging, firecrackers, music, singing, and dragons parading through Chinatown and down Swanston Street. This is a nine day festival though most people I know seem only to know about the main Sunday event. It's a massive festival with loads happening on the main Sunday including free kids activities and a number of music stages. 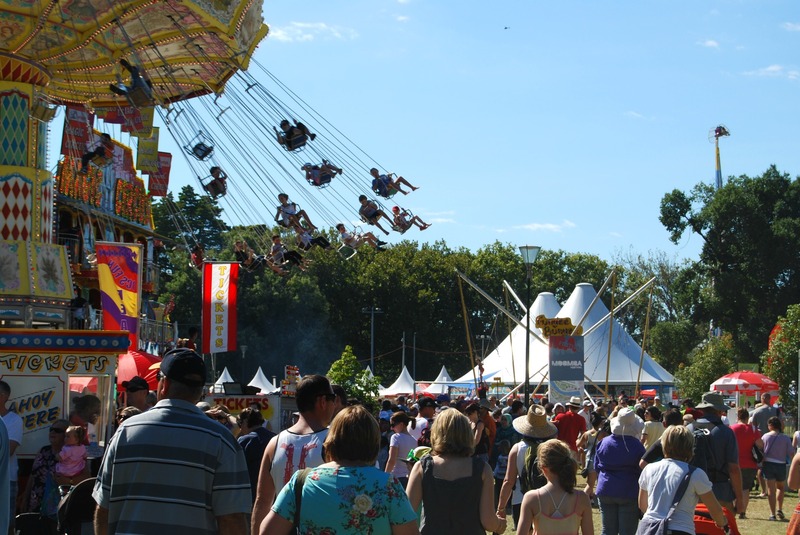 The festival also usually includes an Aboriginal and Torres Strait Islander music festival earlier in the week which will also include kids entertainment. Other days there'll also be comedy, poetry, visual art, theatre, beach sports and lots and lots of music. This Festival normally begins with a traditional blessing by Buddhist monks and an opening ceremony followed by continuous entertainment on stage with performances of Thai dancing, kickboxing, music and more! The riverbank side of Fed Square will have food tents, beer gardens, a music stage, massage areas, cooking demonstrations and stalls selling Thai goods. This is a good day out seeing all the traditionally dressed people and stage performances of drumming, sumo wrestling and music. This is part of Victoria's Cultural Diversity Week and used to be called the Viva Victoria Festival.- a fun-filled program of music, dance, film and activities all day. 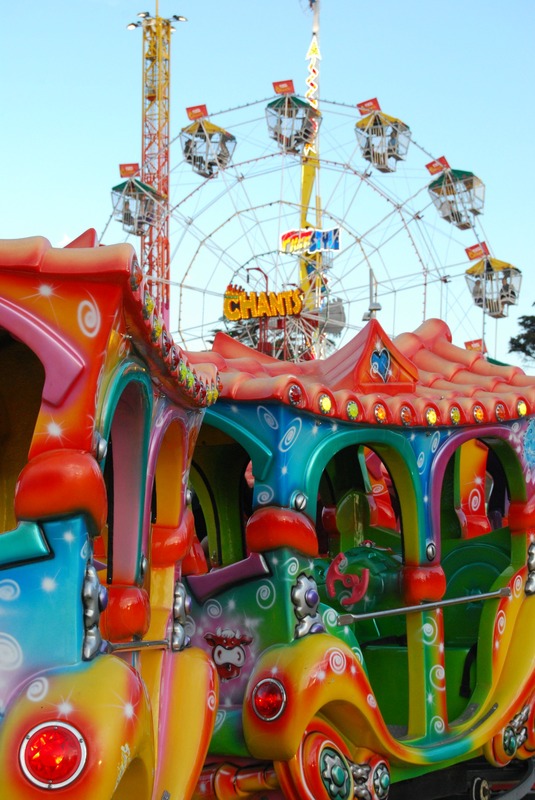 The Moomba Festival – every Labour Day long weekend. Moomba is famous for it's Parade with the 'Moomba King and Queen', the Birdman Rally on the Yarra River where contestants try and fly or glide over the river as far as possible (not very far normally! ), a Carnival in Alexandra Gardens and nightly fireworks. 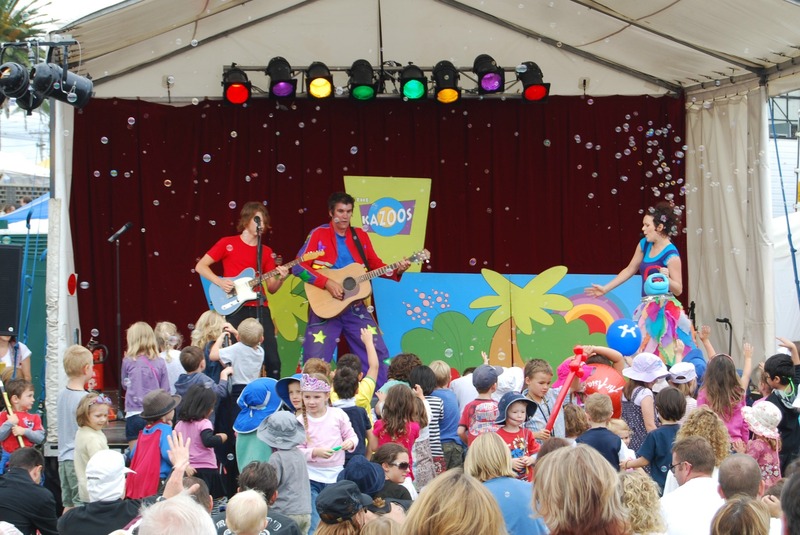 There's all sorts of other stuff too though like waterskiing and skate park competitions, kids activities and a jam-packed music program with headline acts and up-and-comers. All events are free. With a near 30 year history, this is one of melbourne's biggest, genre-diverse annual music happenings with two weeks of shows and events, some of them free, including the Sydney Road Street Party which begins the event for a day of music, performances, food and culture and the festival ends with Music for the People, a free family concert. This festival was apparently started by Barry Humphries and Peter Cook in 1987 and is now one of the top three largest comedy festivals in the world with three and a half weeks of comedy. You have to pay for a lot of the shows but there are always some free shows. This day is a public holiday in Victoria. ANZAC stands for Australian and New Zealand Army Corps. The soldiers in those forces became known as ANZACs. 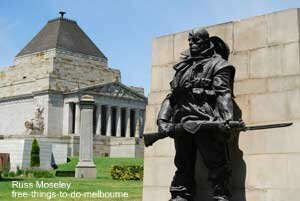 The 25th of April marks the anniversary of the first major military action fought by Australian and New Zealand forces during the First World War but now also recognizes the service of all Australians who serve in war or peacekeeping operations. The day always starts with the Dawn Service held at the Shrine of Remembrance around 6am, then there is a parade of thousands of veterans, descendants and current serving personnel from about 9am from Fed Square to the Shrine of Remembrance. 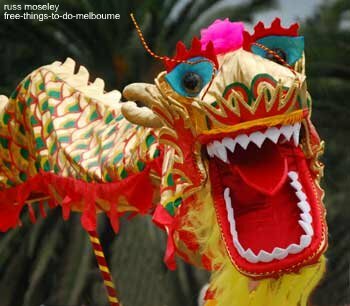 Buddha’s Day and Multicultural Festival celebrates Melbourne’s diverse multicultural society. Running over two days, the Festival commemorates the birth of the Buddha, one of the most significant days of the Buddhist calendar, and highlights and promotes cooperation, community understanding and harmony. The Festival includes the traditions of Buddhist ceremony such as the 'Bathing of the Buddha', daily Dharma ceremonies, the Wishing Bell and traditional incense offerings and also has cooking demonstrations, cultural dance and performances from around the globe, music, art and craft and normally also special activities and programs for children. Although you have to pay for most of the shows, there's usually some free shows during the 10 days of this festival. This is an annual event in Federation Square. It usually starts at the beginning of June for about 6 weeks and brings together local and international artists for free events, performances and exhibitions and ends with the Solstice Celebration on the Saturday closest to the true winter solstice which has family friendly entertainment including live music, storytelling and roving performances. See The Light in Winter. Melbourne Writers Festival brings together writers from around the world to celebrate literature, explore ideas, and inspire readers. Each year their audience is challenged and entertained to learn and be inspired through a buzzing program of storytelling, conversation and discussion, intellectual debate, educational programs, live performance, music and art events. The Festival includes events for people of all ages and more than a quarter of the program is free. The Melbourne Spring Fashion Week celebrates all the colour, excitement and talent that Melbourne has to offer. It includes free fashion parades, workshops and activities which are all about fashion for real people. City Square usually holds many of the free shows and there's usually a Family Day so kids can join in. Melbourne Day/Enterprize Day is celebrated annually and commemorates the first arrival in Melbourne of Europeans. They arrived in 1835 on the northern bank of the Yarra River where the commemoration takes place (now called Enterprize Park), travelling on a schooner called the Enterprize. I haven't been for a while but what used to happen is the day starts with the flag raising ceremony and morning tea at Enterprize Park as the Lord Mayor hoists the flag of Melbourne and starts off the live entertainment with aborigine music and dancing. Then there is a cannon volley over the river by the Historical Re-Enactment Society. I went to this the first year I arrived in Melbourne and was amazed at how few people were watching – I had expected half the city to be there! At mid-day there is a City Square celebration and you can also normally have free entry on Enterprize, a replica of the ship that brought the first settlers – it’s normally berthed at Waterfront City, Docklands. The kids will love this if it is still one of the events. The Grand Final Parade normally runs from the Old Treasury Building on Spring Street to Yarra Park via Wellington Parade which is in front of Fitzroy Park. 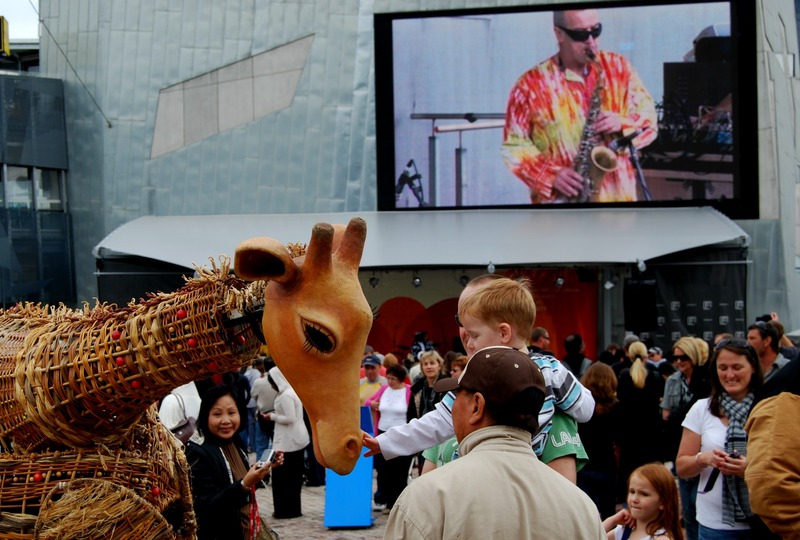 There's also usually loads of free family entertainment at Federation Square. Check www.afl.com.au and www.fedsquare.com for details closer to the event. The Melbourne Fringe Festival is an independent arts festival held over three weeks from late September to early October. It celebrates art for everybody and includes theatre, performance art, comedy and music. Up to a third of the events have been free in previous years. Click here to find the website. Melbourne Festival (previously known as the Melbourne International Arts Festival) is a two week festival celebrating all the arts including dance, theatre, visual arts, multi-media, circus, music and more, with acts performed by established national and international artists as well as newcomers to the scene. Check www.festival.melbourne for more details. While Diwali is commonly referred to as the ‘festival of lights’, for Hindus it is actually about celebrating inner light and the belief that good will triumph over evil. Diwali is normally celebrated at Federation Square. Enjoy Indian films, music, Bollywood dance performances, fireworks, a food area serving up authentic Indian cuisines and hundreds of glittering lamps to light up the ‘darkness’. This parade takes place a day before the famous Melbourne Cup horse race. Every year thousands of people turn up to watch this parade of racehorses, jockeys, trainers and celebrity guests. Federation Square normally also has loads of free entertainment laid on with interviews of the Melbourne Cup trainers and jockeys before the "Race that stops a Nation" starts. This parade takes place either end October or first week of November. Melbourne Music Week is a City of Melbourne program that celebrates and supports the city's independent music scene with both paid for and free events in places around Melbourne including concerts in may unusual locations, workshops, film screenings and more. The New Years Eve celebrations in Melbourne are the city’s largest free celebrations with two fantastic firework displays (one at 9.15pm so the kids can get home to bed and another at midnight), live band performances, roving performers, DJs, and lots of entertainment programs that can be enjoyed by the entire family. There are many activities and events for children. There are normally venues all over the city from where you can see the celebrations and fireworks. I'm just rebuilding this page at the moment so bear with me!! Do you know a good event which I've missed? Let me know and I'll include it.